You've heard it before: we are all standing on the shoulders of giants. Everything we do in this moment rests upon everything that we've inherited from the previous moment. We are reaching out to ourselves through centuries of accumulated ambition, innovation, and illumination, stretching through the muck and glory of human history. This is how our collective knowledge and wisdom continues to grow and expand from generation to generation—passed on from giant to giant, each picking up where the previous left off, while adding a new unique piece to the puzzle. 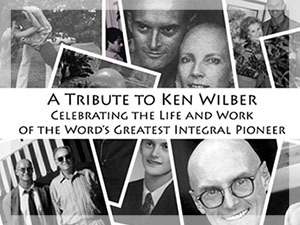 This year we are excited to celebrate one of the biggest and most important giants around: the one and only Ken Wilber. For those of us who have consumed his work and who wisdom in our own lives, we know that we are now standing on Ken Wilber's shoulders. As Jack Crittenden says, "the 21st century literally has three choices: Aristotle, Nietzsche, or Ken Wilber." Those are some mighty shoulders indeed. We are fortunate enough to have inherited Ken's unique vision of an integrated world. We can feel this inheritance every day in our hearts, in our minds, and in our souls—inspiring us, uplifting us, and urging us to leave the world just a little bit more whole than we found it. Let’s all honor Ken's extraordinary life and legacy, paying tribute to all the incredible work Ken has done over the decades to put so many pieces of our human puzzle together, resulting in a radically new vision of life, the universe, and everything. It's a vision that we have all come to know and love, calling us to become better men and women, to cultivate more wisdom and deeper compassion, and to live our lives with greater clarity, purpose, and authenticity.